The Gonet Monofoil is extremely fast and innovative; it is also beautiful! Filmmaker Christophe Margot has followed his evolution, from the initial concept to record attempts, and made the video clip below, which we invite you to discover. The AM38 test boat, better known as the Mule, touches both sunlight and the sea for the first time. 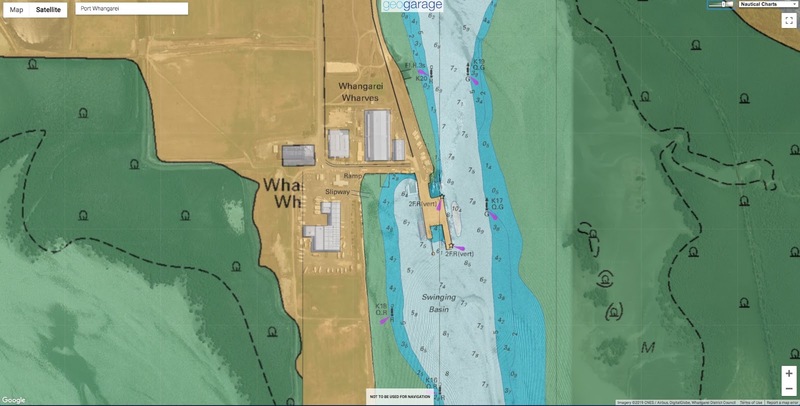 Half the size of the AC75 racing boats set to be used in the 36th America's Cup (Auckland, New Zealand, 2021), the Mule has New York Yacht Club American Magic, the U.S. 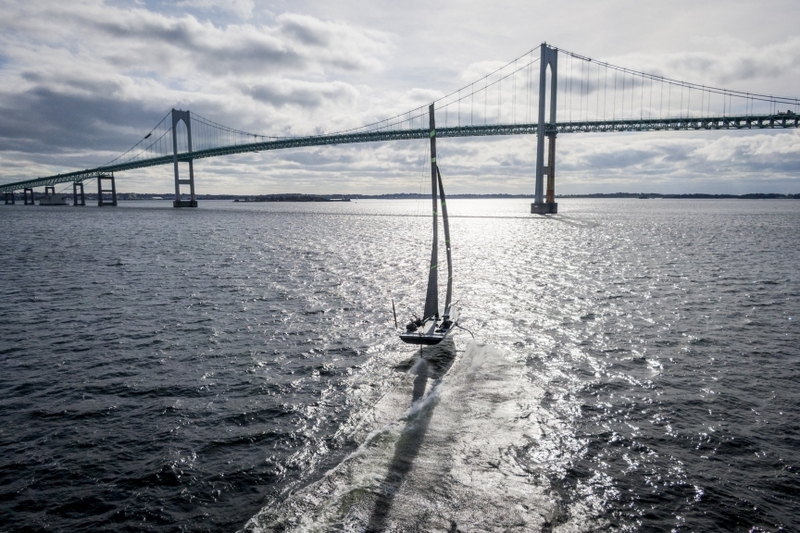 Challenger for sailing's highest prize, flying across Narragansett Bay near Newport, Rhode Island. The F50s from Australia, China, Great Britain, France, Japan and the United States lined up together on the water for the first time less than a week before the inaugural race in Sydney. And in view of the images of the boats flying in training, the show looks sensational. On Dec. 4, the FV3 model from the National Weather Service predicted a major snowstorm for Washington five days later. The storm missed the city. It is slated to become the Weather Service's flagship model in March. But many meteorologists familiar with the model fear it is unreliable. The Weather Service announced Wednesday that the model, known as the GFS-FV3 (FV3 stands for Finite­ Volume Cubed-Sphere dynamical core), is “tentatively” set to become the United States’ primary forecast model on March 20, pending tests. It is an update to the current version of the GFS (Global Forecast System), popularly known as the American model, which has existed in various forms for more than 30 years. The introduction of the FV3 is intended as the Weather Service’s next step toward building the best weather prediction model in the world, a stated priority of the Trump administration. The current GFS model trails the European model in accuracy, and it has for many years, despite millions of dollars in congressional funding dating back to 2012, after Hurricane Sandy hit. Numerous meteorologists who have experience using the FV3 worry it’s not ready for prime time and have been underwhelmed by its performance. For months, its predictions have been publicly available, on an experimental basis for forecasters to evaluate. When news broke about the Weather Service’s intention to make the FV3 the United States’ primary model, meteorologists unleashed a torrent of complaints and negative reviews on Twitter. “From what I have seen . . . not impressed,” tweeted Ryan Hanrahan, chief meteorologist for the NBC affiliate Hartford. "I have no faith in the FV3 [for snowfall forecasts].” tweeted Judah Cohen, a meteorologist at Atmospheric Environmental Research known for his long-range prediction of the polar vortex. Mike Smith, who recently retired as a senior vice president at AccuWeather, said the FV3 is not an improvement over the model it will replace. “I don’t see any way in which FV3 provides better weather forecasts versus the current GFS,” he tweeted. The model has tended to overpredict snowfall in the heavily populated Interstate 95 corridor in the Mid-Atlantic and Northeast, setting off false alarms in a region where forecasts are particularly consequential. In Boston, which has seen just six inches of snow this winter, Eric Fisher, chief meteorologist for the CBS affiliate, remarked that the model had predicted “multiple” 30-inch snowfalls. Here in Washington, we have documented multiple cases in which its snowfall forecasts several days into the future have been erroneously high. In early December, it was predicting double-digit amounts for Washington four days before a storm tracked to the south and no snow fell. On Monday, the FV3 was predicting double-digit totals for a storm on Saturday in the Washington region, and it now calls for little snow. FV3 model snow forecast for Mid-Atlantic and Northeast through Saturday issued on Tuesday. It predicted over 10 inches for Washington, and current forecasts are now for little or no accumulation. Cliff Mass, a professor of atmospheric sciences at the University of Washington, has traced the problems in its snowfall forecasts to predicting temperatures “far too cold in the lower atmosphere” more than a few days into the future. “One impact of this cold bias is the production of too much snow at low levels — a problem seen consistently around the country,” Mass said in an email. A concern is that if forecasters cannot rely on the FV3, they will be left to rely only on the European model for their predictions without a credible alternative for comparisons. And they’ll also have to pay large fees for the European model data. Whereas model data from the Weather Service is free, the European Center for Medium-Range Weather Forecasts, which produces the European model, charges for access. But there is an alternative perspective, which is that forecasters will just need to adjust to the new model and learn to account for its biases. That is, a little short-term pain is worth the long-term potential benefits as the model improves. “One can think of the new model as a brand new 2019 automobile replacing your old, trusty grocery getter,” Ryan Maue, a meteorologist specializing in modeling who helps operate the website weathermodels.com, said in an email. The Weather Service stands strongly behind the model. Its director, Louis Uccellini, said the model underwent “rigorous and unprecedented testing and validation” over three separate summers, winters and hurricane seasons. “The scientific and performance evaluation over the past year shows that the new dynamic core provides results equal to or better than the current global model in many measures, although additional improvements are still needed,” he wrote in a statement. Meteorologists outside the Weather Service do not doubt that, in the long run, the FV3 can improve and help the United States make strides in weather prediction. “As an optimist, I see the ‘American model’ trending in the right direction and am willing to see how it further evolves,” wrote Marshall Shepherd, professor of atmospheric science at the University of Georgia, in a commentary at Forbes. In addition, President Trump recently signed into law the Weather Research and Forecast Innovation Act Reauthorization, which establishes the NOAA Earth Prediction Innovation Center, aimed at further enhancing prediction capabilities. But even while NOAA develops relationships and infrastructure to improve the Weather Service’s modeling, the question remains whether the FV3 can meet the forecasting needs of the moment. Until the problems identified are addressed, its introduction could represent a step back in U.S. weather prediction despite a well-intended effort to leap forward. Mother Nature Network : How well can we predict a hurricane's punch? 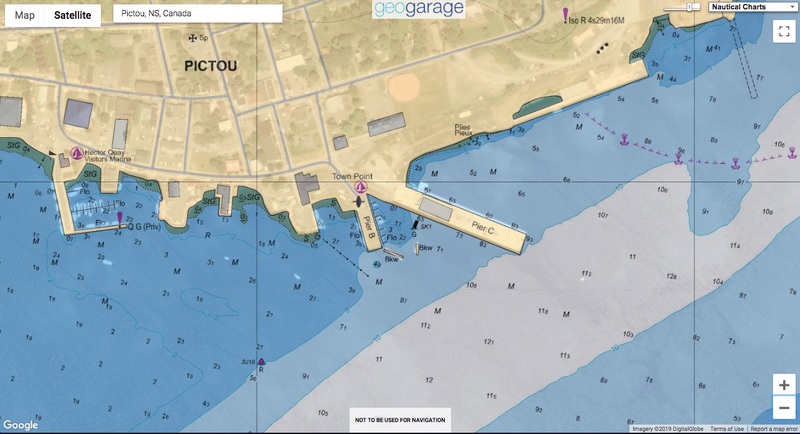 Information sourced from the Oceans and Maritime Program shows the Exclusive Economic Zone. Maritime boundaries are normally pegged to often isolated shards of land. 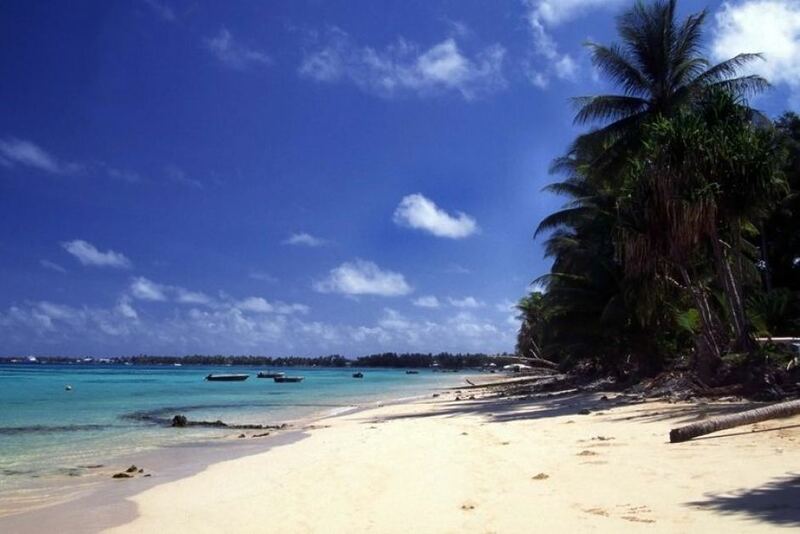 As the sea level rises, many small islands in the Pacific could end up underwater. 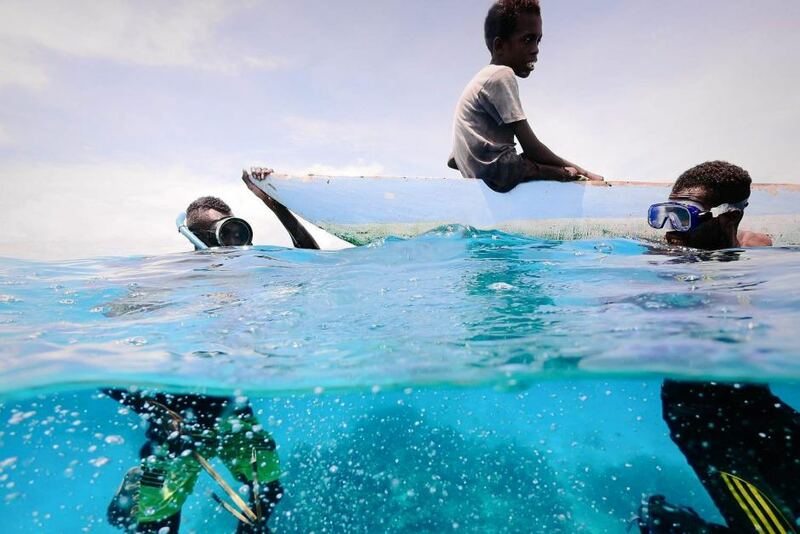 Three boys spearfishing in Carteret islands. 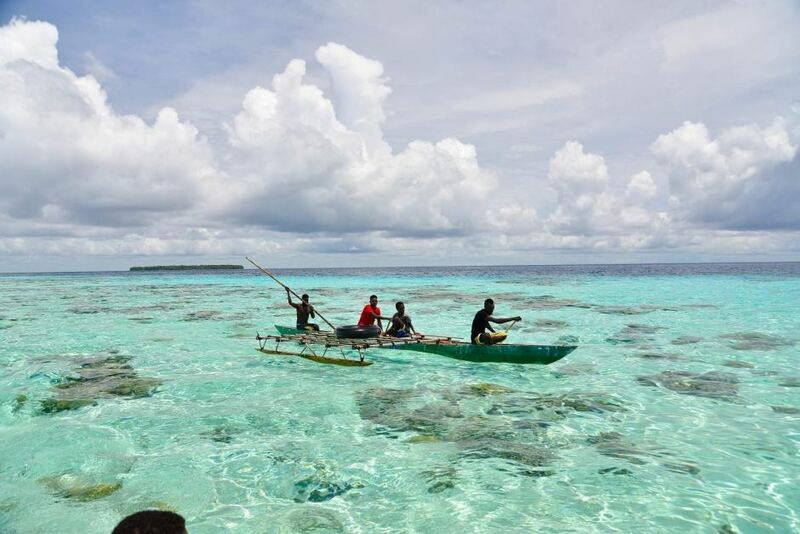 Some Pacific leaders might spot an advantage in the shifting seascape. 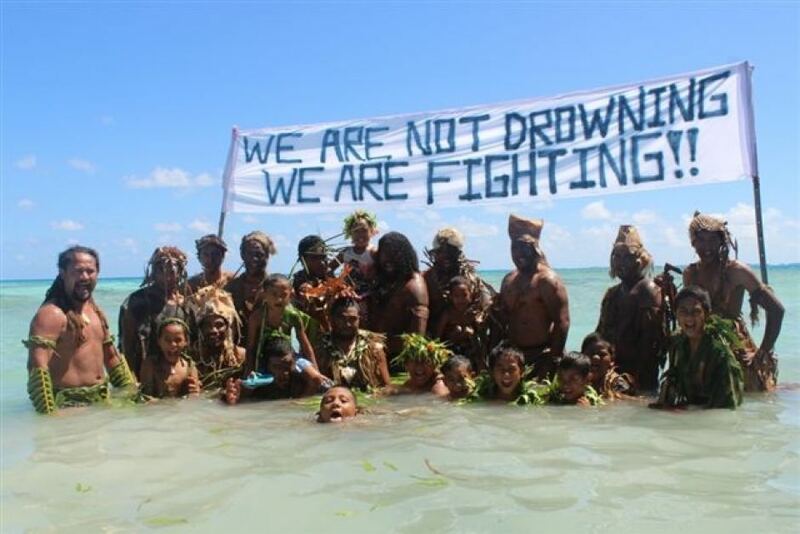 But there are also several contested borders in the Pacific, and rising sea levels threaten to make the situation worse in the future. 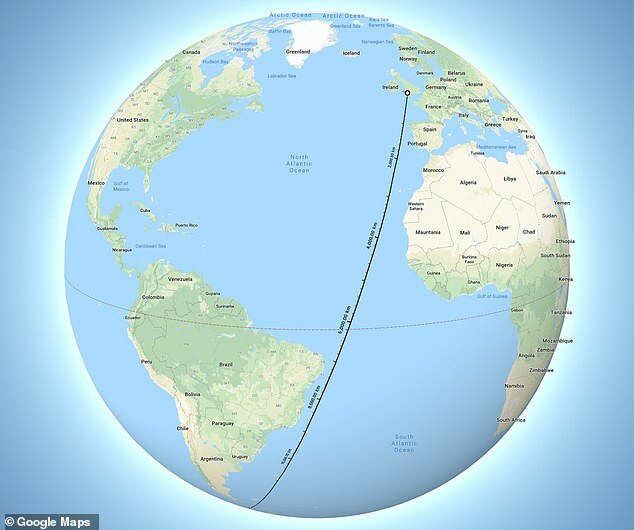 Amazing map proving you can sail from Britain to New Zealand in a straight line ? The sea journey from the UK to New Zealand could be much less complicated than people think if made through the route shown on the map above. 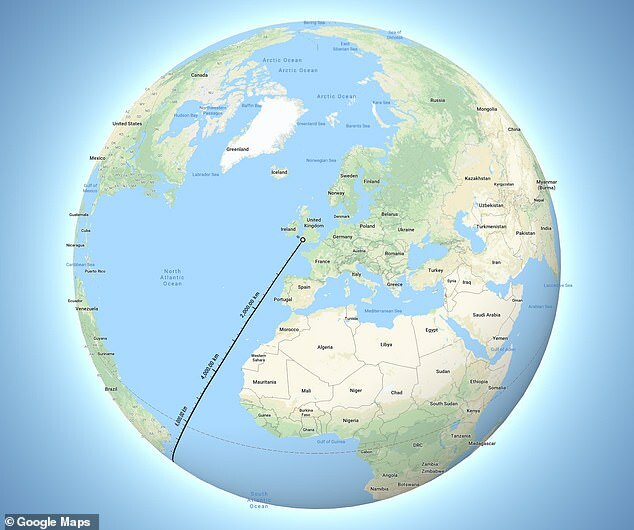 According to a traditional world map, such a journey would be impossible due to the sea and land masses in the way and would have to circumvent the southern tip of Africa. Travelers could sail from Britain to New Zealand in a straight line, a staggering new map has shown. The 12,000 mile journey may be less complex than most people think, if made directly through the North and South Atlantic oceans. According to a traditional world map, such a journey would be impossible due to the sea and land masses in the way. The direct passage shown on the new map would however mean travelling through treacherous stretches along the edge of South America. 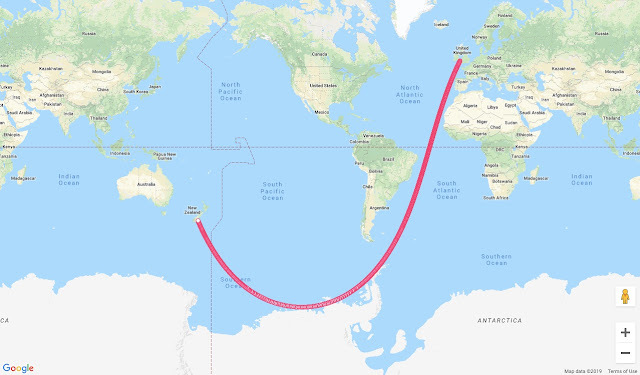 Map with a corrected scale shows how the sailing route from the UK to just below New Zealand is a line, and not a curve. 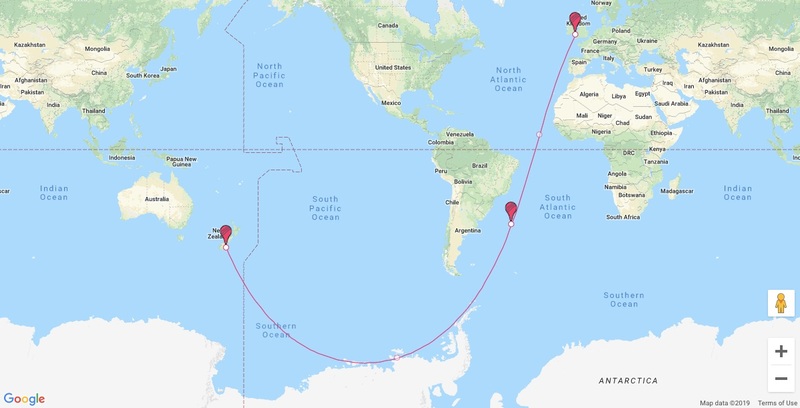 This route would mean a clear sea passage can land sailors close to New Zealand without having to traverse across treacherous passages such as the formidable Drake Passage between South America's Cape Horn and the South Shetland Islands of Antarctica. The route can go in a straight arrow from one country to the other but may not be the most practical route due to treacherous sea faring stretches along the east side of South America. 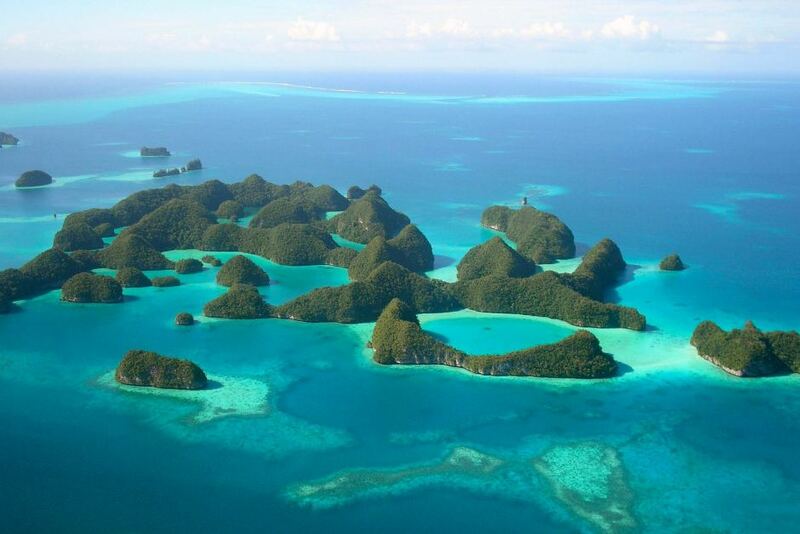 Traditionally, sailing to New Zealand required circumventing a lot of land mass. 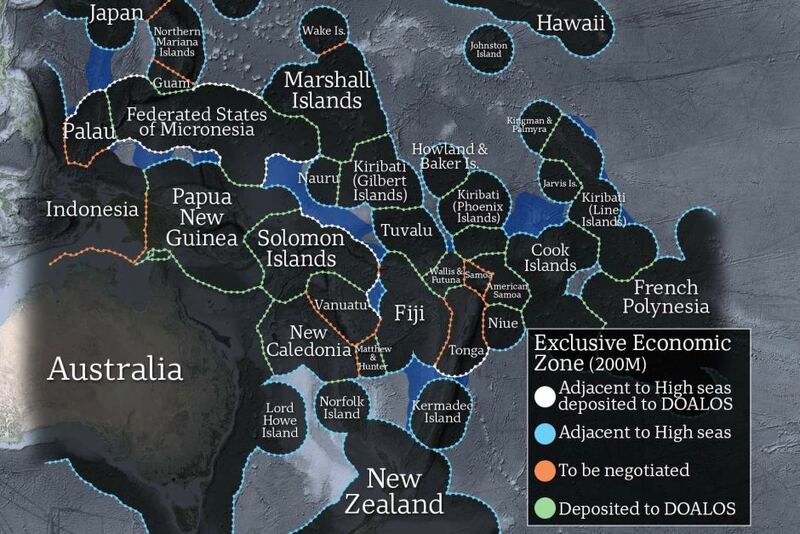 According to this new map which claims to use a more realistic scale, a sailor could set a straight course and land up just near New Zealand. On a standard world map, drawn using scales of the Mercator projection, landmasses are shown much larger than they actually are. 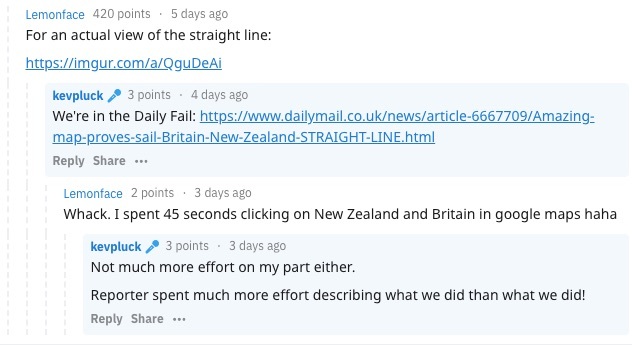 Two Reddit users, u/kevpluck and Lemonface showed how the route between the UK and New Zealand, when shown on a different scale, can be made in almost a straight line. The trajectory they use lands you just south of New Zealand. 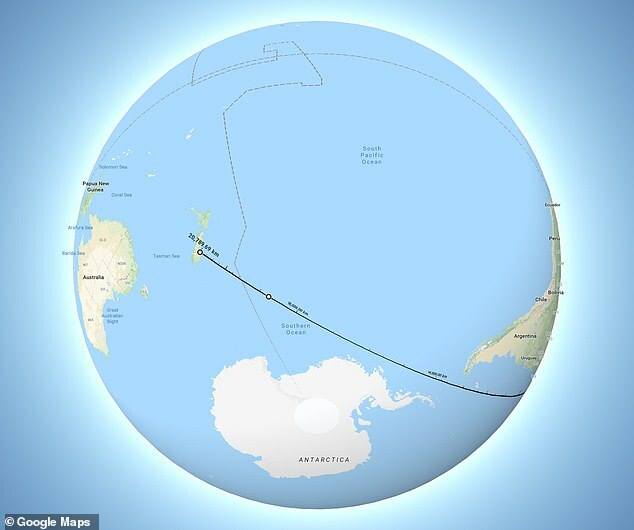 The proposed sailing route would however take sailors over the formidable Drake Passage between South America's Cape Horn (near the southern tip of South America) and the northern islands of Antarctica. Historically, the clipper route that went via south Africa and Australia was used by ships travelling between Europe and the Far East, and as far as Australia and New Zealand. 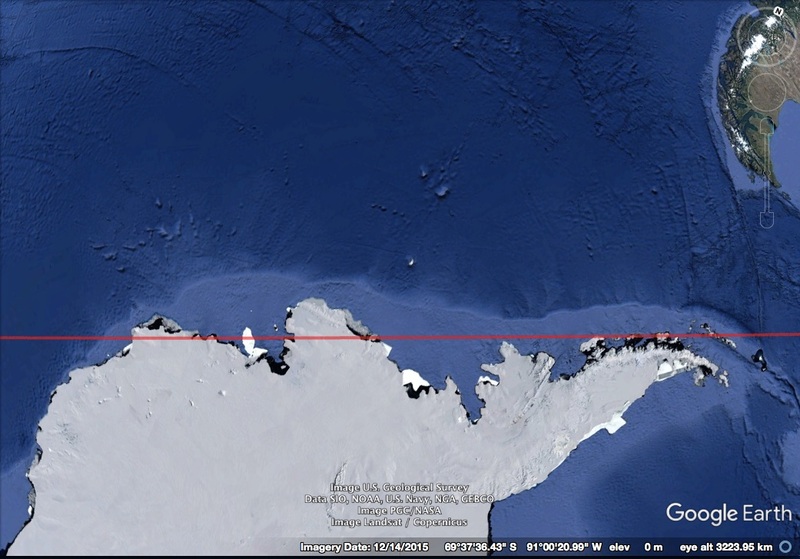 This route remains the fastest sailing route around the world. However, bad conditions along this path, particularly at Cape Horn saw off many ships and their crew. It fell into commercial disuse with the introduction of steam ships, and the opening of the Suez and Panama Canals which overtook as popular routes for reaching Australia and New Zealand. 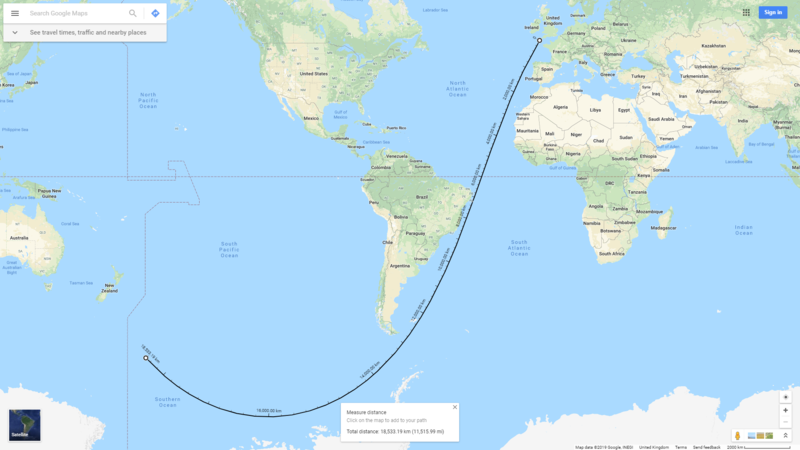 Reddit : Traveling South-Southwest from Hawaii toward Antarctica, there's a perfectly straight path which crosses the International Date Line seven times, going today-tomorrow-today-tomorrow-today-tomorrow-today-tomorrow. 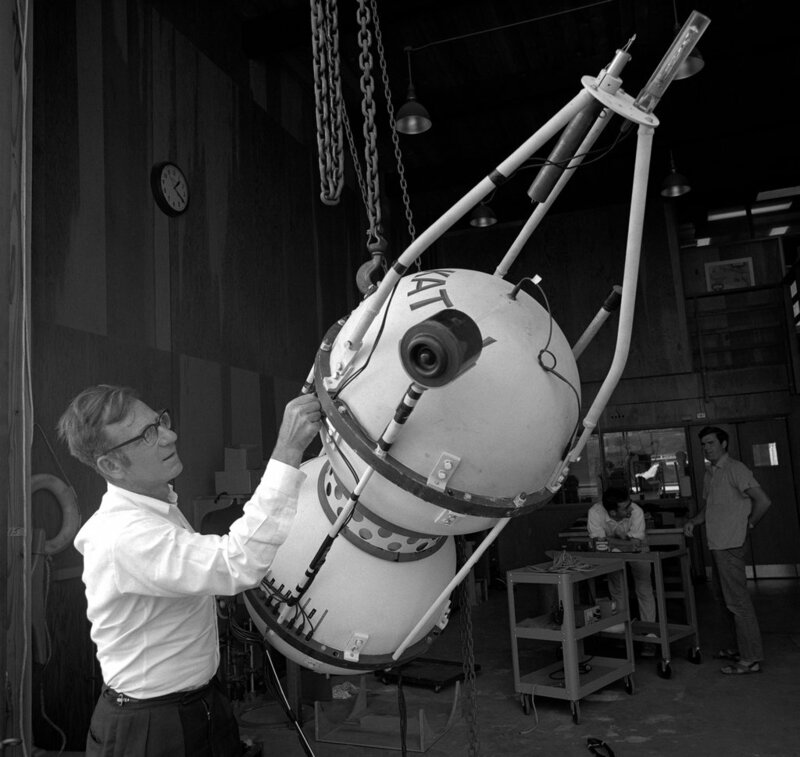 Walter Munk in 1963 with a tide capsule. The capsule was dropped to the seafloor to measure deep-sea tides before such measurements became feasible by satellite. Walter H. Munk, one of the foremost oceanographers of the 20th century, who sent pulses of sound through the vast oceans — probably startling a few whales — to measure changes in water temperatures, forecast waves and seek signs of global warming, died on Friday at his seaside home in the La Jolla section of San Diego. The University of California, San Diego, reported his death on its website. His home, named Seiche, is near the university campus, where he spent his career at the Scripps Institution of Oceanography after joining its faculty in 1947. “We thought he would live forever,” his wife, Mary Munk, told The San Diego Union-Tribune. She said the cause of death was pneumonia. Dr. Munk, a scientist-explorer who would expound on his discoveries with exuberance, was sometimes called the “Einstein of the oceans” for his pioneering work in the study of waves, ocean circulation, tides and irregularities in the Earth’s rotation. This documentary showcases Walter Munk's research on waves generated by Antarctic storms. The film documents Munk's collaboration as they track storm-driven waves from Antarctica across the Pacific Ocean to Alaska. The film features scenes of early digital equipment in use in field experiments with Munk's commentary on how unsure they were about using such new technology in remote locations. 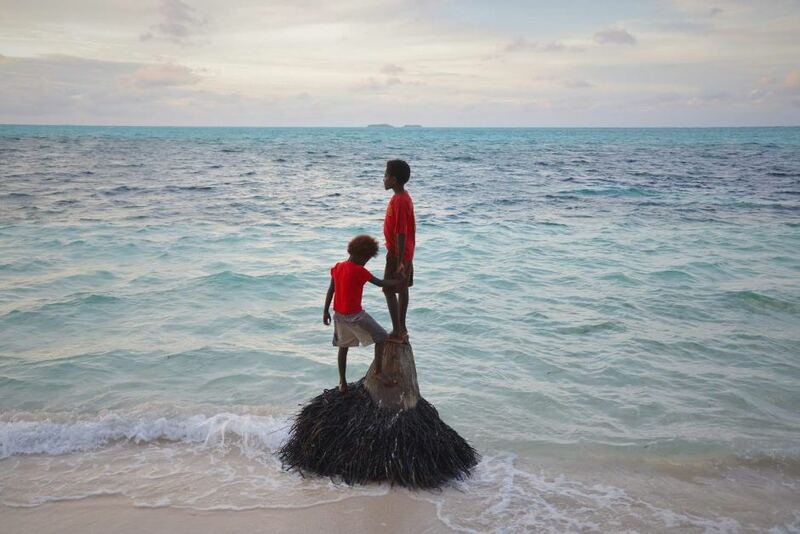 In one 1960s study — which did not have to look far for a subject — he discovered that the waves washing ashore in measured ranks in Southern California had originated thousands of miles away in storms sweeping across the southern Indian Ocean. The discovery led to improved forecasting of the big waves coveted by surfers. From Bondi to Bundoran, Pipeline to Mavericks, surfers around the world depend on the surf forecast to catch the perfect wave. Its inventor, Walter Munk, dies at 101– yet few surfers know his name, despite the debt of gratitude they owe him. As a young scientist during World War II, he and Harald U. Sverdrup , the director of Scripps at the time, developed a method for predicting the size of the surf on beaches during amphibious landings so that landing craft could avoid being swamped. 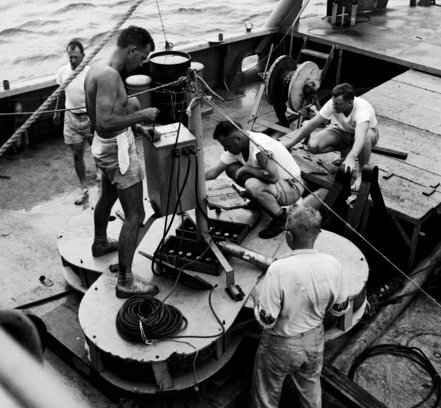 Dr. Munk, left, observing an oceanographic instrument during the Capricorn Expedition (1952-1953), somewhere between Eniwetok and Tonga in the Pacific. The method was first used in the American landings in North Africa in 1942. It later predicted, correctly, that the waves would be high but manageable during the D-Day landings by the Allies in Normandy on June 6, 1944. The technique, also used in amphibious landings in the Pacific, was credited with saving the lives of thousands of soldiers and Marines. Because sound moves faster in warm water than in cold, the technique can measure differences in average temperature over a long distance. Dr. Munk and his colleagues demonstrated its feasibility by transmitting a pulse of sound from a loudspeaker lowered into the water near Heard Island in the Indian Ocean in 1991. It was detected by listening stations thousands of miles away. “And that was the best news that I’ve ever heard,” Dr. Munk told The New York Times in 2015. Walter Heinrich Munk was born on Oct. 19, 1917, in Vienna into a wealthy banking family of Jewish heritage, a son of Dr. Hans Munk and Rega Brunner. The couple divorced when Walter was a child. His maternal grandfather, Lucian Brunner, was a prominent banker and Austrian politician. His stepfather, Dr. Rudolf Engelsberg, was later briefly a member of the Austrian government of Chancellor Engelbert Dollfuss, who was assassinated by Nazi agents in 1934. Growing up in Vienna, Walter took frequent trips to the Austrian countryside, and his father served occasionally as a chauffeur to Franz Joseph, the Austrian emperor, during World War I. “He had the only Rolls-Royce in Vienna,” Dr. Munk said. At 14 he was sent to New York to attend an upstate boarding school with the idea that he would eventually work at a branch of a private New York bank connected to his family. On graduating, he became a runner at the bank to learn the business from the bottom up. But after three years, during which he took classes at Columbia University, he decided that he was not cut out for banking and left for California. He turned up at the California Institute of Technology and asked to be admitted, although he had not filed an application. The dean, no stickler for procedure, accepted him once he passed the entrance exam. Walter Munk earned a bachelor’s degree at Caltech in 1939 (the same year be became an American citizen), a master’s degree there a year later and his Ph.D.
at the University of California, Los Angeles, for work done at Scripps. He volunteered for the Army in 1939, but after 18 months in the ranks he was excused from military service to do research on anti-submarine warfare for the Navy. His Army unit was subsequently sent to New Guinea to fight the Japanese and was nearly wiped out. Dr. Munk’s first marriage, to Martha Chapin Munk, ended in divorce. His second wife, Judith, died in 2006 after more than 50 years of marriage. He married Mary Coakley in 2011. In addition to his wife, he is survived by his daughters Edie and Kendall and three grandsons, U.C. Another daughter, Lucian, who had been born with a heart defect, died at age 7 in 1961. 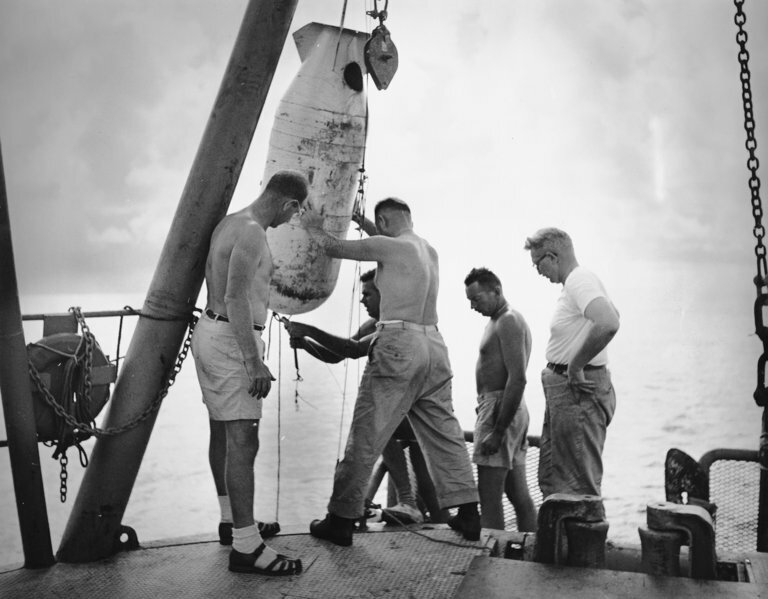 After the war, Dr. Munk participated in studies of the atomic tests in the Pacific. He and a colleague were given 10 days to measure the circulation of water in and out of the Bikini Lagoon before an atomic test there in 1946, and he witnessed it from a raft 10 miles from ground zero. Because of concerns that an atomic blast might cause a tsunami, he developed a warning system. In the 1950s, he carried out research in geophysics, founding an institute for studies in that field at Scripps and explaining with a colleague why the Earth wobbles on its axis and why its spin varies slightly. Dr. Munk was a member of the National Academy of Sciences. Among the awards he received were the National Medal of Science, the Crafoord Prize of the Royal Swedish Academy of Sciences and the Kyoto Prize in Basic Sciences, which he received in 1999 for his work in physical oceanography and geophysics. He was the first scientist in his field to win the award. Dr. Munk also engaged in research on climate change, particularly how rising sea levels affect the Earth’s rotation (measured in millionths of a second per year). He praised the 2015 Paris climate accords and called for a global effort to deal with the issue. During a question-and-answer session at the University of Delaware in 2016, a reporter asked him what society should do about climate change. “Einstein was a great man,” he once said to The Union-Tribune. Photographer Tom Peschak was down to the last frames on his roll of film when he captured the photo he'd been waiting for: a great white surfacing behind researcher Trey Snow's kayak. "Instead of the scientist tracking the shark the shark is tracking the scientist," Peschak says. When I began work ten years ago on a book about white sharks, I had no idea that this project would yield my most well-known image to date. For more than ten months I worked together with Michael Scholl and scientists at the White Shark Trust to create novel images of white sharks in South Africa that would illustrate current scientific research. The team observed large numbers of white sharks venturing into extremely shallow water during the summer months. In order to figure out why, the researchers tracked and observed the sharks’ movements, but were regularly thwarted for two reasons. First, the inshore realm was treacherous, humped by rocky reefs and sandbanks, which heaved the research boat precariously during an onslaught of large swells. Secondly, the boat engine's electrical field seemed to affect the sharks' behavior. I suggested using a kayak as less obtrusive photographic platform to track white sharks. I was met withcautious enthusiasm, so I was voted to be the one to test the waters. Even though we repeatedly tested the sharks’ reactions to an empty kayak, the first few attempts at a manned kayak were nerve-wracking. As I sat in the “yum-yum” yellow sea kayak, a 15-foot (4.5m) great white shark ambled towards me. However, white sharks are much more cautious and inquisitive than aggressive and unpredictable. And this proved true with our experiment; at no time did the sharks show any aggression toward us or our little yellow craft. The story of this particular photograph began on a perfectly calm and glassy sea. I tied myself to the tower of the White Shark Trust research boat and leaned into the void, precariously hanging over the ocean while waiting patiently. The first shark came across our sea kayak, dove to the seabed, and inspected it from below. I trained my camera on the nebulous shadow as it slowly transformed into the sleek silhouette of a large great white. When the shark’s dorsal fin emerged, I thought I had the shot but hesitated a fraction of a second. In that moment, the research assistant in the kayak, Trey Snow, turned to look behind him, and I took the shot. Throughout the day I shot many more similar images, but all lacked the connection of first image. A developed roll of slide film shows the moments leading up to the picture photographer Tom Peschak refers to as "the ultimate shark scientist picture." I knew the image was iconic, but I was not prepared for the public response. When the photograph was first published, it attracted more than 100,000 visitors to my website in 24 hours. Many thought the photo was a digital fake, and to date there are still hundreds of websites that debate its authenticity. Not only is the image real, it was one of the last images I took using slide film before transitioning to digital. All magazines and prints were taken from a high-resolution scan of the slide with no post-production work. Over the years the image continued to sell and just when I thought it had run its course, the image resurfaced on April 1, 2006. The French magazine, Le Magazine des Voyages de Peche (The Magazine of Fishing Voyages) published an April Fool’s Day article that told the story of professional fishermen Arnold Pointer from south Australia who accidentally caught a large female white shark in one of his fishing nets. Instead of killing her, he set her free and named her Cindy. From that day forward, the shark followed Arnold every time he set out to sea. Two years later this hoax was immortalized in a YouTube slideshow, which used my photograph, purportedly showing Cindy the white shark following Arnold in his yellow kayak. The video received nearly 1.6 million hits and introduced the white shark kayak to a new audience, albeit in an inaccurate if humorous context. On August 21, 2011, Hurricane Irene battered the Caribbean island of Puerto Rico and flooded many streets. I could never have imagined that my photograph would make an appearance in this context, except this time it was only the shark, minus the kayak. On August 24 the shark appeared on a social news website in the form of a photograph taken from the open window of a car driving along a flooded street. Next to the car was “my” white shark swimming through the flooded streets of Puerto Rico. The image was then picked up and used in a TV bulletin on Channel 7 News Miami. A closer examination of the shark revealed that it was identical to the shark following the kayak in my photograph. It appears that a crafty Photoshop artist superimposed the shark into a scene of a flooded street. The composite resurfaced again in June of 2012, when a shark tank supposedly burst in a popular mall in Kuwait. The photo depicted two sharks (one of which was mine) swimming at the bottom of a submerged escalator. The most recent incarnation appeared in the wake of Hurricane Sandy, which devastated the eastern coast of the U.S. This time, the shark made the same appearance outside a car window in the flooded streets of New Jersey. I always look forward to receiving e-mails from friends and family who have spotted the same white shark in a different context. While I will probably never become a legend in my own right, at least my white shark is well on her way.